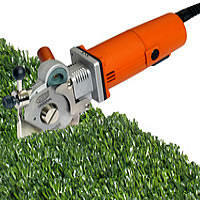 The electric Rasor® Speedcut 2 is ideal for cutting sports turf & track by hand. 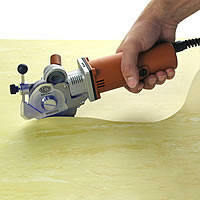 It’s lightweight, versatile, and able to make curved cuts. 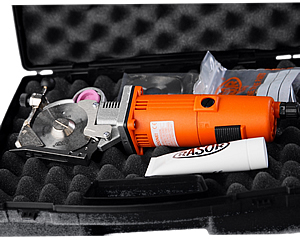 This unit is perfect for on the field cutting and comes with a sturdy, convenient carry case. 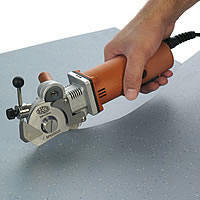 It ensures sharp, precise cuts without fraying. Thanks to the new fiber opening system, the blade only cuts the backing as turf remains intact. 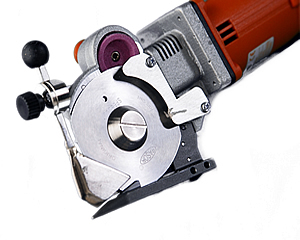 It can be used to cut any turf and any backing without limits. The Speedcut 2 is only hand-held electric cutter in the world that rivals the cutting power of pneumatic hand held cutters. We also carry the GREENCUTTER GC-10 Automatic electric double blade cutter for synthetic turf to be installed in sport facilities. 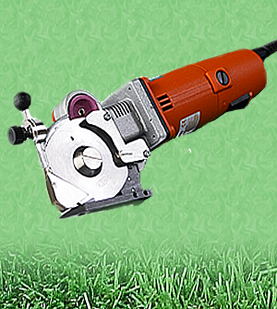 GreenCutter GC-10 s the new Rasor® double blade electric cutting equipment for synthetic turf in sport plants. GreenCutter GC-10 is the latest generation system and can be used either for turf lining and edging. GreenCutter GC-10 is used for rapid and easy single cuttings (edge), double cuttings (lining) and cuttings of the overlapping turfs for a perfect coupling of the rolls. The width of lines can be adjusted between 5 and 20 cm (2 to 8 inches). Our Professional Sports Turf Sewing machines, are USA made, precision with few exceptions. Turf Sewing equipment and we offer immediate service, and affordable pricing. 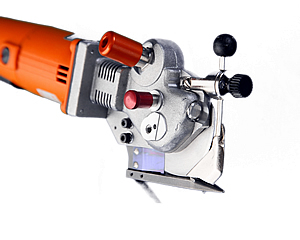 If you have any questions please don't hesitate to contact us about Turf Sewing Machine, stadiums, Fields, Arena, Sport Fields, artificial turf repair, Sport Field fake grass, synthetic grass Repair, Synthetic, Fields, sports, surfaces, stadiums, arenas, machines, turf sewing, sports field machines, astroturf.